Canine Train Tracks espouses the philosophy of Positive Training. This means that we use positive, i.e., force-free means such as food, toys, praise, and other rewards valuable to the dog in order to motivate behavior. This method is based on the (scientifically supported) idea that dogs, like humans, respond better to positive feedback than negative “correction”. Positive training emphasizes humane, force-free methods as opposed to the physical punishment, pain, intimidation, or fear. Applying this principle of positive training means we do not hit or yell at the dog, use tools like choke, prong, or electronic shock collars, or use any other aversive techniques to influence his behavior unless absolutely necessary. Accordingly, positive training opposes any dominance theory that insists on “showing the dog who’s boss” or “putting the dog in her place.” Instead, it builds a cooperative, trusting, and, as the name suggests, positive relationship between the dog and the human. Dogs repeat behaviors that are rewarded. Dog must be forced to behave. Teaches alternatives to unwanted behaviors. Corrects mistakes without teaching alternatives. Dogs & their humans enjoy training. Dogs & most humans do not enjoy training based on punishment. Based on research on how dogs and other animals learn. Zoos and aquariums use positive training too. Based on dominance theory rooted in outdated research on wolves. Intimidation is used to show your dog who’s boss. Dogs learn to trust their owners. Can lose your dog’s trust using punishment (yelling, shaking, squirting, hitting, yanking, throwing something at the dog, shocking, etc.). Reinforcement makes behavior stronger when applied randomly. Punishment is ineffective when applied randomly. Looks at the root of a behavior problem (i.e., most aggression is fear-based; so you want to create positive associations with the trigger, not punish your dog). Suppresses a behavior without addressing the problem (i.e., choke chains to suppress aggressive barking). The problem may reappear in a new unwanted behavior. Cannot create fear & anxiety issues. Can create fear & anxiety issues. Provides mental stimulation. Dogs think. Some dogs shut down to avoid punishment. Manages the environment to help dogs practice wanted behavior. Dogs are corrected for unwanted behaviors. Builds a cooperative relationship with a willing partner. Dog is punished as a teaching tool, even before the dog knows what’s expected. Doesn’t cause injury to dogs or people. Dogs and people can be injured using force. 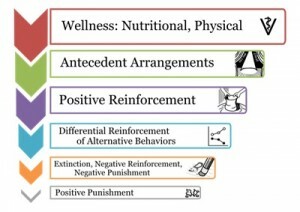 This is the hierarchy of techniques used by positive trainers, with positive punishment (in the form of force) used only as a last resort. Positive training is not only more fun for dogs and humans, it is also the method most conducive to help our best friends learn desirable behaviors and also develop into healthy, happy, well-adapted dogs.